A line of soldiers adorned in flowered garlands threaded their way across the Karen National Defence Organisation’s parade ground in Karen State. The parade on the last day of January ushered in the first year that members of three Karen armed groups celebrated Karen Revolution Day together. Members of the Karen National Union, the Democratic Karen Benevolent Army, and the KNU/KNLA Peace Council used the day’s festivities to commemorate the anniversary of the KNDO’s fight against Burma Army aggression in the Rangoon suburb of Insein in 1949. 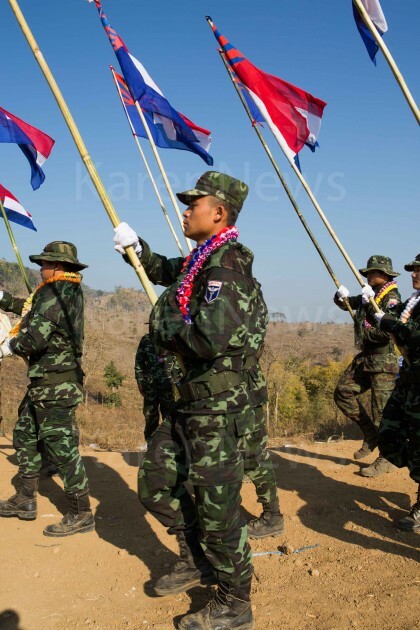 A similar observance of the 65th anniversary of Karen Revolution Day in KNU’s 7th Brigade also included members of these three Karen groups, who until recently were enemies. Of chief concern among attendees was the ceasefire between the Karen National Union and the Burma government now approaching its second year – a ceasefire that one prominent military commander fears is jeopardized by the government’s actions. Gen. Ner Dah said the KNDO (historically a defensive wing of the KNU that works with the Karen National Liberation Army) would remain ready in the face of mounting allegations that the Burma Army has been reinforcing its area positions. Ceasefire talks between the Burma government and KNU that began in 2004 broke down after the Burma Army was accused of using the cessation of hostilities to cement its military positions, in addition to perpetrating grave human rights abuses and launching a massive offensive in 2006. The Border Consortium, which provides aid to refugees in Thailand, estimated that more than 27,000 people were displaced from their homes that year as a result of renewed fighting. The possibility that this ceasefire might last, however, gives hope to some Karen State residents. Mr Tharckabaw approaches the ceasefire cautiously and sees a need for continued vigilance against possibly exploitative commercial development. At the same time, he also sees vast potential stretching across Karen State. Mr Tharckabaw moves easily between topics. With a soft-spoken eloquence, he’s equally at home discussing fuel combustion processes or Burmese demographics, reaching regularly for mints to curb the lifelong tobacco habit he quit last month. One danger, according to Mr Tharckabaw, is that those in powerful positions are not always immune to such temptations. Gen. Ner Dah, a former Karen National Liberation Army battalion commander who was promoted to his new position last year, underscored concerns that the quasi-civilian government at Burma’s helm is less than honest in its pursuit of a nationwide ceasefire. Mr Tharckabaw’s view, hewn in part from years spent serving as vice-president of the KNU, reflects these sentiments. To him the government-led Myanmar Peace Centre, tasked with coordinating the nationwide peace process, is merely a government organ serving its own interests. “It portrays itself as neutral, but it is pro-government,” Mr Tharckabaw said. As head of the KNU’s alliance affairs department, Tharckabaw’s grander vision of cohesion extends not only to the once-fractured Karen armed groups, but also to Burma’s other ethnic minorities. He dreams of a Burma in which oppression is extinguished and a constitutionally mandated federal system is made a reality. U Wizana, also known affectionately as the “Rambo Monk” for his past gun-toting activities along the frontline, remains hopeful about the future of Karen unity. In a speech to those attending the commemoration, the senior monk also said peaceful negotiation is key to settling disputes among Karen groups, highlighting his role in defusing tensions between DKBA Klo Htoo Lah and Border Guard Force members around Myaing Gyi Ngu. The gradual repairing of tense relations among Karen armed groups is a watershed moment for Mr Tharckabaw, who explained that the then-Democratic Karen Buddhist Army broke away from the KNLA in a 1994 split that the veteran political leader said was engineered by Burma government intelligence agents. “The original KNU, and two splinter groups, the DKBA, and KNU/KNLA Peace Council, they sort of split and went in a hurry believing in the promises of the enemy before the present Burmese government, and now they realize they didn’t get anything, and the promises were empty,” Mr Tharckabaw said. The broader notion that Karen State’s troubles might be resolved across a negotiating table, rather than through the scope of a rifle, provides a sense of relief to some. For Mr Tharckabaw, the struggle for Karen State’s destiny is far from resolved, but it is a struggle that will ultimately be fought on a different sort of battlefield.